LAS CRUCES, N.M. – The New Mexico State baseball team beings its 2015 home schedule against Incarnate Word on Friday, Feb. 27 at the newly renovated Presley Askew Field. The Aggies will host the Cardinals in a three-game series beginning on Friday at 6 p.m. (MT) and at 1 p.m. on Saturday and Sunday. MEDIA COVERAGE: NM State baseball fans will have plenty of opportunities to follow their Aggies on the radio again this season with the new voice of Aggie baseball, Adam Young on KRUX 91.5 FM and online, free of charge. The Aggies will broadcast at total 32 baseball games this season, plus any in the post season. There will be 15 broadcasts online only while the rest of the games will be both online as well as on KRUX. Friday’s home opener against Incarnate Word will be broadcast only online at www.NMStateSports.com, while Saturday and Sunday’s games will be available online and on KRUX 91.5 FM. 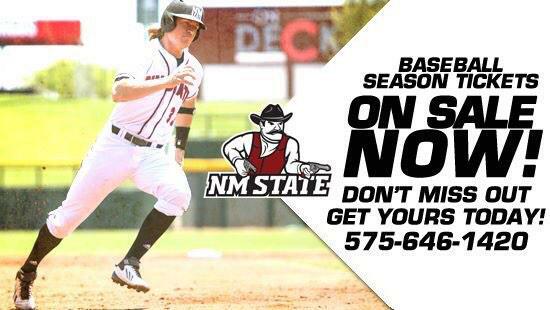 Live stats are available all season long by going to www.NMStateSports.com and clicking on the live events tab. Live stats are free of charge all season. SOCIAL MEDIA: Fans can keep up with score updates and other information by logging on to Twitter @NMStateAggies. Fans can find out about promotions and everything else Aggie by going on Facebook and searching for NM State Athletics as well as The Aggie Student-Athlete. See various photos of NM State athletics photos on Instagram @NMStateAggies. TICKETS: Fans can call the Pan American Center ticket office or call (575) 646-1420 to purchase tickets ahead of time or walk up to the ticket booth at Presley Askew Field to buy tickets the day of the game. Fans can also log on to TicketMaster.com for tickets to Aggie baseball. Season tickets for baseball are $100 for reserved seating, $75 for general admission seating. NM State faculty and staff get a great discount for season tickets paying only $50 for reserved seats and $37.50 for general admission. Single game tickets cost $10 per game in the reserved section and $5 a game for general admission. Children 12-and-under can enter the games for free, while NM State students also get in free. Call the Pan American Center Ticket office to ask about group rates for groups of 10 or more.